Aloha! We’re the family of VeggieFarm Hawaiian Sweet Purple Potato (Khoai Lang Tím) growers, farming in the finest sweet potato. 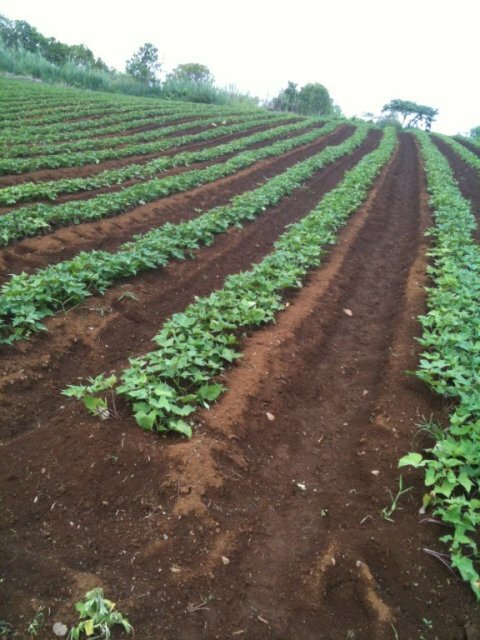 Our sweet potato, grown under the sunny and rich soil of Hawaii, are individually selected so you can be sure that they are of finest quality. We ship anywhere in the US. Hawaii Purple Sweet Potato 19 lb box mixture of 2/3 regular size and 1/3 fingerlings. Potatoes arrived fast and without hassel. The potatoes themselves were of very high quality. Will be ordering again. I got a 19-lb box and every single one of them was really good, from small to big. The yams taste fresh and the quality is top notch, much better than the ones sold at my local Korean and Chinese supermarkets. The prices are about the same. it is the best quality purple yam. My friends here love it. It can be a great gift. These wonderful sweet potatoes start out lavender with white skin. Roasted, the flesh turns royal purple and candy sweet. The flesh is a little drier than orange and yellow sweets I've had, but not so dry as our local white sweet potatoes here in Maryland (which are also delicious). In contrast, SC purple sweet potatoes--which I just found in a local market--have dark purple skins and the normal sweetness of their common yellow/orange cousins. These Hawaii sweets are wonderful in soups, stews, tagines, baked, fried and as sweet potato pie, of course. My only complaint, they were quite small the first time I ordered, tedious for making pies, but perfect roasted in the oven. I hope to get more of a range of big and small potatoes this time around. I won't take a star off for size. This is a perfect item for any age and very nutritious gift too.We love it since we found them!